Getting a good night’s sleep is essential, without it our minds wouldn’t function, our body’s would wither and atrophy and eventually we’d become unconscious and probably die. Human’s are “programmed” to sleep and that is a fact and so using a pillow therefore is of major importance. 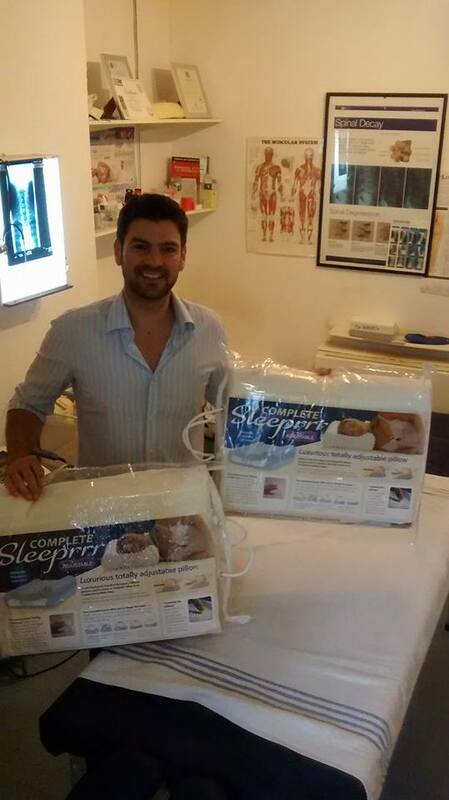 At The Chiropractic Clinic – Croydon we provide Complete Sleeper memory foam pillows to help promote proper sleeping support. Sleeping is important for the brain- the processing of memories and the clearance of the clutter during our subconscious deep sleep (REM). During sleep our brains process all of the thoughts we’ve accumulated during the day and it sorts them into different “reservoir banks” based on Importance –like a computer. It keeps them for later use and sets reminders for the following day for us like feeding the dog before work, remembering to pick up a friend etc. With a little sleep deprivation for many of us, everything is thrown out of kilter. Lack of sleep affects our social behavior, we become less patient, it becomes easier to misinterpret social cues and it can get us into awkward situations as a result. All of which would likely be helped with a decent pillow. At The Chiropractic Clinic in Croydon we stock a full range of memory foam pillows and provide demonstrations to help people choose the right pillow for them. Even if we are getting enough sleep, being approximately 6-8 hours each night it’s not just how long we sleep, it’s how we sleep that’s becoming increasingly important. Sleeping without adequate support for the neck and shoulders can be detrimental to its function, leaving us sore, achy and stiff. A chiropractor can help manage joint dysfunctions with chiropractic adjustments but using a proper pillow to help support the neck complements chiropractic treatment. During fetal development in our mother’s wombs we develop a “primary curve” which is kyphotic or convex like a “C” shape. The primary curves remain in the mid back (thoracic spine) and the Sacro-coccygeal area from fetus to death. However from birth through to the rest of our lives we’ve developed two natural lordotic “secondary curves” (concave) in the neck and lower back. Complete Sleeper Memory foam pillows are designed to support the neck and cradle the head taking stress away from the neck joints while we sleep. For most of us it’s the secondary (lordotic) curve in the neck that benefits most from adequate pillow support. If you’ve had a chiropractor or health professional explain to you about forward neck carriage, anterior head tilt and rounded shoulders (upper cross syndrome) you may also have a straightening of the normal cervical (neck) lordotic curve which can be incidentally show up on an X-ray. Those of us with a “straight” neck can develop poor neck posture and mechanical neck pain and so in addition to exercise, chiropractic and physiotherapy a proper pillow is an appropriate recommendation. Memory foam was originally developed for use in space travel by NASA and more recently has been used commercially for pillows. Memory foam pillows are designed to promote proper neck posture while sleeping and resting in bed. The big difference with memory foam is it’s temperature sensitive and moulds to the body with increasing heat, gradually becoming more comfortable as we rest on it. A decent pillow may help with improved sleep duration, promote improved posture and complement a chiropractic adjustment program for alignment of the cervical spine. Neck pain and tension headaches may also improve with combination therapy and a correct choice in pillow. Enquire at The Chiropractic Clinic Croydon about Complete Sleeper Memory foam chiropractic pillows and ask for help, advice and demonstrations. For Complete Sleeper Memory Foam Pillows, call today!